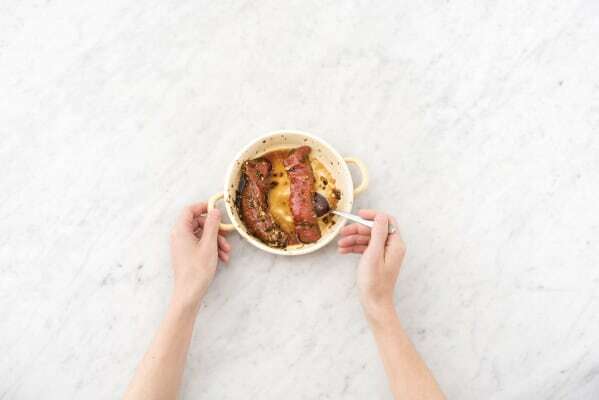 Do you know what the secret is to perfectly caramelized marinades? A pinch of sugar! It adds a hint of sweetness to balance out the spiciness of the jalapeños and tanginess of the lime juice. 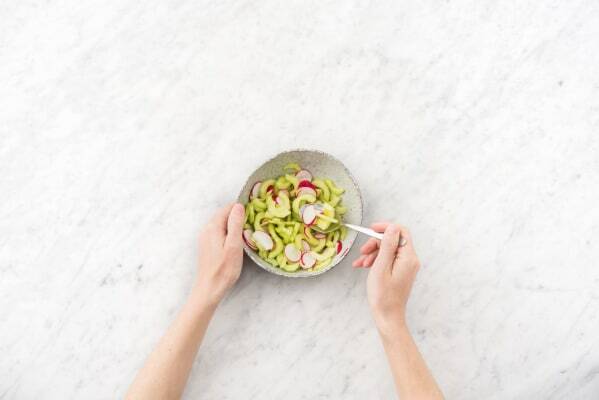 The other star of this meal is the pickled cucumber and radish salad. It’s quick, crunchy, and one of our go-to side dishes. Cook the rice: Bring 1 cup water to a boil in a small pot. Once boiling, add the rice. Cover and cook 20 minutes, until tender. Remove from heat and keep covered. Wash and dry all produce. Mince or grate the garlic. Mince half the jalapeño. Thinly slice the other half into rounds, removing the ribs and seeds if you prefer less heat. Zest and halve the lime. Slice the steak in half, making two 1/2-inch fillets. 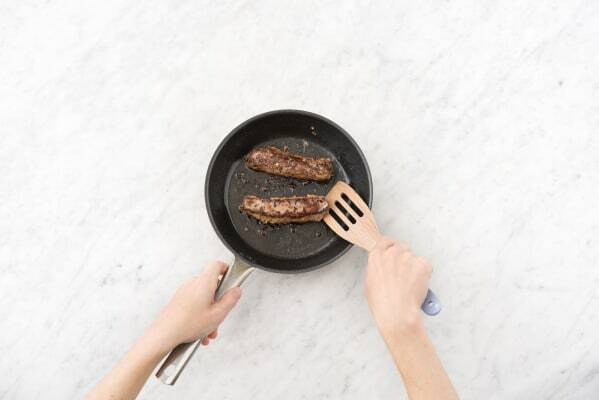 Place the steak fillets in a medium bowl with the garlic, soy sauce, lime zest, 1½ teaspoons sugar, minced jalapeño (to taste), and a drizzle of oil. Season generously with salt and pepper. Turn the steak to evenly coat in the marinade. Thinly slice the radishes. Peel and halve the cucumber lengthwise. Scoop out the seeds with a spoon, then thinly slice into half-moons. Toss both in a medium bowl with the white wine vinegar, ½ teaspoon sugar, and a large pinch of salt and pepper. Heat a drizzle of oil in a large nonstick pan (or grill pan) over high heat. Add the steak. Sear about 2 minutes per side, until browned and slightly charred. HINT: The sugar on the glaze may burn a bit, but that’s ok! Char + caramelization = flavor! Make the herb salad and serve: Pick the mint leaves off the stems. Tear any larger leaves in half. Discard the stems. Toss the leaves in a small bowl with a squeeze of lime, a large drizzle of oil, and as much sliced jalapeño as you like (careful, it’s spicy!). Season with salt and pepper. 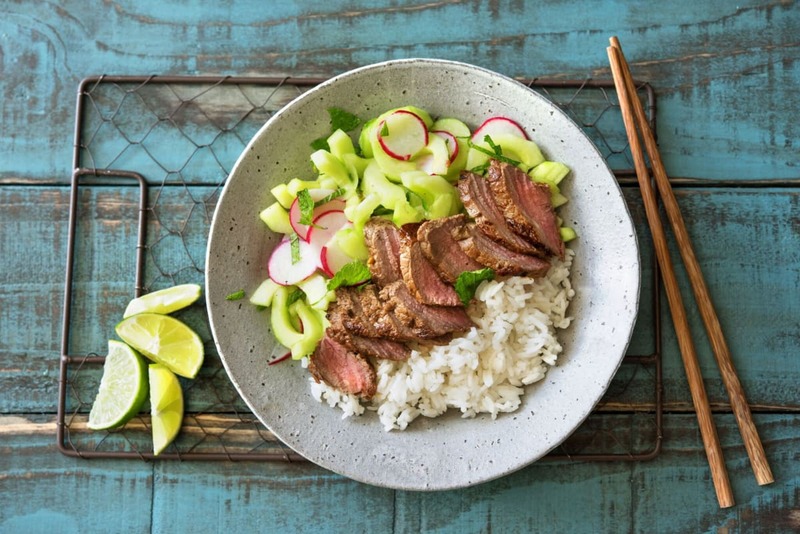 Thinly slice the Vietnamese-marinated steak, and serve on a bed of jasmine rice. Scatter the herb salad over the steak, and serve the quick pickled veggies on the side. Enjoy!